Last spring I worked on a project called Crayola Art Adventure. The project was made for the Leapster and featured a number of Crayola products via a series of art lessons. 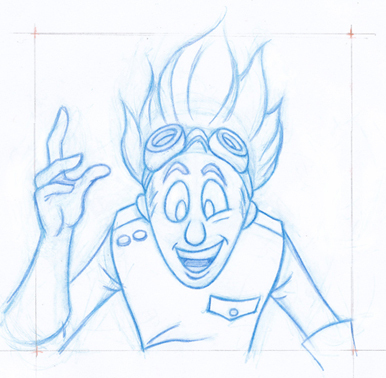 I developed the art lessons, story-boarded and made character designs for the project. Below is a sketch of the character I designed. His name is Roy G. Biv. It’s funny, I am left handed but that has never come up in my work before, but over the years I have developed a habit of drawing things from right to left so I don’t smudge my drawings. After I had animated a few of the drawing lessons for this project and they had kid tested them, they noticed that the lessons seemed left handed. I hadn’t done this intentionally, it’s just become part of the way I work. Then again it even came out in the drawings I did of Roy. As you can see, he is gesturing with his right hand – because I was using my own right hand as drawing reference (I, however, have five fingers not four). Note that he has five fingers now. The backgrounds I did for these story panels were inspired by the old UPA cartoons. I love that style. I’ll show you one last bit of that project. 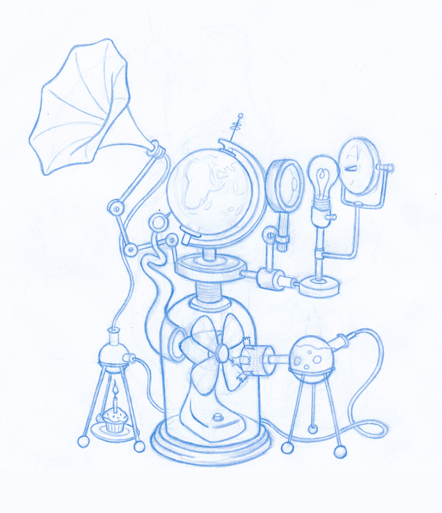 Below is a sketch of a contraption I did. 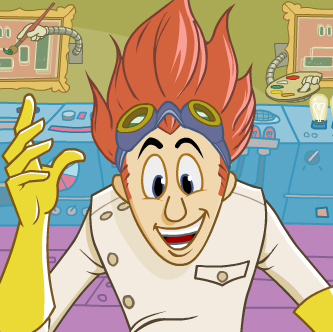 Roy G. Biv is kind of a mad scientist type character and this machine he built is meant for producing colours. See if you can find the logic in it. It almost makes sense if you don’t think too much. Either way it was fun to draw. This past summer I worked on a title for Leapfrog’s new Leap Pad called Disney Animation Artist. It was a tough project, but worth the effort in the end – and it’s been one of the top sellers for the Leap Pad. 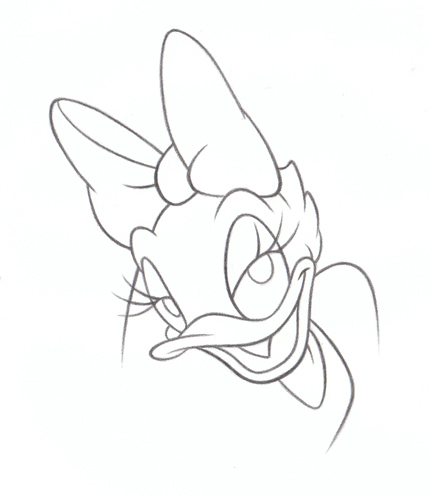 I was creating drawing and animation lessons using Disney’s heritage characters; Mickey, Minnie, Donald, Daisy and Goofy. I lead the animation on the project with Eric Goldberg supervising. I have to admit, I was pretty intimidated when I found out he was reviewing my work – I’ve been a real fan of his for years. He animated the Genie in Aladdin and did that amazing Rhapsody in Blue section in Fantasia 2000 among many other accomplishments. Unfortunately, I wasn’t in direct contact with him, but his comments on my work were very kind and informative. While I was animating this project I listened allot to Clay Kaytis’ Animation Podcast. If you are interested in animation, it’s definitely worth checking out. You can see the commercial for the product on Youtube here. Unfortunately, it looks like they had a compleetle gleetch during Mickey’s dialogue. It looks much better on the Leap Pad.